MAXIM Integrated Products, represented by Arrow Electronics , has released the MAX8710/MAX8711/MAX8712, linear-regulator, power-supply solutions for thin-film transistor (TFT), liquid-crystal display (LCD) panels used in LCD monitors and LCD TVs. Each device includes a high-performance AVDD linear regulator, a positive charge-pump regulator, a negative charge-pump regulator and built-in power-up sequence control. 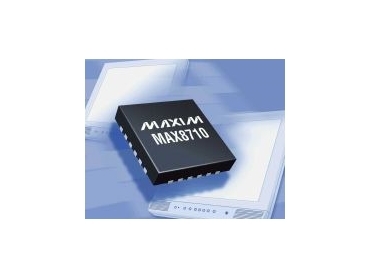 The MAX8710/MAX8711 include a high-current operational amplifier. Additionally, the MAX8710 provides logic-controlled, high-voltage switches to control the positive charge-pump output. The linear regulator directly steps down the input voltage to generate the supply voltage (AVDD) for the source driver ICs. The two built-in charge-pump regulators are used to generate the TFT gate-on and gate-off supplies. The high-current operational amplifier is typically used to drive the LCD backplane (VCOM) and features a high output current of 150mA, a fast slew rate of 7.5V/μs and a wide bandwidth of 12MHz. Its “rail-to-rail” inputs and output maximise flexibility. The MAX8710 is available in a 24-pin TQFN package. The MAX8711 is available in a 16-pin TQFN and the MAX8712 in a 12-pin TQFN package. Each package is 4mm x 4mm with a maximum thickness of 0.8mm for ultra-thin LCD panel design. These controllers operate over the 40°C to +100°C temperature range.